Cofoundress of the Order of Poor Ladies, or Clares, and first Abbess of San Damiano; born at Assisi, 16 July, 1194; died there 11 August, 1253.She was the eldest daughter of Favorino Scifi, Count of Sasso-Rosso, the wealthy representative of an ancient Roman family, who owned a large palace in Assisi and a castle on the slope of Mount Subasio. Such at least is the traditional account. Her mother, Bl. Ortolana, belonged to the noble family of Fiumi and was conspicuous for her zeal and piety.From her earliest years Clare seems to have been endowed with the rarest virtues. As a child she was most devoted to prayer and to practices of mortification, and as she passed into girlhood her distaste for the world and her yearning for a more spiritual life increased. She was eighteen years of age when St. Francis came to preach the Lenten course in the church of San Giorgio at Assisi. The inspired words of the Poverello kindled a flame in the heart of Clare; she sought him out secretly and begged him to help her that she too might live "after the manner of the holy Gospel". 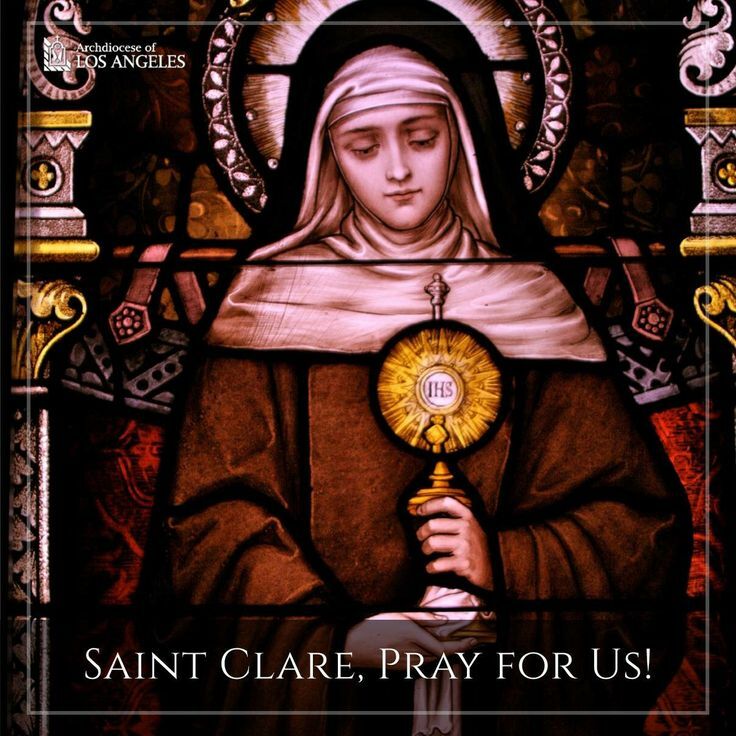 St. Francis, who at once recognized in Clare one of those chosen souls destined by God for great things, and who also, doubtless, foresaw that many would follow her example, promised to assist her. On Palm Sunday Clare, arrayed in all her finery, attended high Mass at the cathedral, but when the others pressed forward to the altar-rail to receive a branch of palm, she remained in her place as if rapt in a dream. All eyes were upon the young girl as the bishop descended from the sanctuary and placed the palm in her hand. That was the last time the world beheld Clare. On the night of the same day she secretly left her father's house, by St. Francis's advice and, accompanied by her aunt Bianca and another companion, proceeded to the humble chapel of the Porziuncula, where St. Francis and his disciples met her with lights in their hands. Clare then laid aside her rich dress, and St. Francis, having cut off her hair, clothed her in a rough tunic and a thick veil, and in this way the young heroine vowed herself to the service of Jesus Christ. This was 20 March, 1212.